Cheydinhal Oblivion Gate, outside cave exit. Bremman Senyan is an Imperial warrior and one of the two surviving Knights of the Thorn you will find inside the Oblivion Gate outside Cheydinhal. He is wounded, however, and hiding out from the overwhelming numbers of Daedra there. You will find him along with Farwil Indarys. They will need your help to escape, though unlike Farwil, Bremman is actually somewhat useful in the fights with daedra. During his related quest, he is incorrectly identified as a Breton by the player's character. If both Farwil and Bremman survive during The Wayward Knight quest, Bremman does nothing but follow Farwil around, he doesn't eat, drink or sleep, if Farwil is asleep he'll just stand by his bed, doing nothing until he wakes up. He is equipped with a Knights of the Thorn medallion and a set of steel armor consisting of the cuirass, greaves, gauntlets and boots. He is armed with a steel mace and carries a small amount of gold. When Bremman first sees you he will be relieved to see a friendly face: "Ahh... help at last." Speaking to Bremman before speaking to Farwil while in the Plane of Oblivion will have him advise that you speak to Farwil, "It's good to see a friendly face. I feared we'd never see anyone from Cyrodiil again. I know you must have many questions... speak with Farwil and he'll answer them for you." after saying this he will end the conversation. As you part ways at this point he will say a valediction that expresses how desperate he is: "Please help us." Speaking to Bremman again after speaking to Farwil will have him properly thank you for your assistance; "Even if Farwil doesn't say it, we appreciate that you're here." Asking him about the Knights of the Thorn will have him reply by saying; "Yes, I am a member of the Knights of the Thorn. Or what's left of them anyway. If you want to hear the tale, I suggest you talk to Farwil, our commander." (Contrary to what Bremman says, Farwil will not answer your questions at this time) Asking him about the Oblivion Gate will have him explain what truly transpired during the Knights of the Thorn expedition here; "I'm sure you wish to hear the real story rather than Farwil's version. Not long after the gate opened, Farwil decided an assault was in order. We charged inside, and promptly met resistance. Three of us were cut down in the first wave. We pressed on, at Farwil's behest. At the base of the citadel, we met a larger second wave of foes. We lost two more in that skirmish, as well as Farwil and I being wounded badly. It was at this point we considered retreat. We found the way back blocked by more daedra. So we were stuck here until rescued by you. It's just like Farwil to leap before he looks. Had we brought a City Watch contingent, we might have taken the sigil stone with minimal losses. Instead, Farwil wanted to prove his point. The City Watch and the Knights of the Thorn are always at odds. They think we don't have what it takes, and Farwil wanted to show them. Perhaps we're all to blame. But that's not important right now. We must complete our journey and get that stone. Please help us." Asking him about his commander, Farwil Indarys, will have him ask that you be patient with him; "Don't judge Farwil too harshly. Most of what he says is... fabricated. But he's young, and therefore quite brash and inexperienced. All he wants to do is please his father. I've known him since he was a lad, and fighting to defend Cheydinhal is in his heart. I just wish his heart was bigger than his hubris." As you travel through the gate with Bremman in tow he will offer some commentary; "I fear we're in over our heads." "Strange... with all the lava, you'd think I'd be warm, but all I feel is a bone-chilling cold. Perhaps it's fear..." Ending a conversation with Bremman at this point will have him advice that you remain on the move; "Let's keep moving." Speaking to Bremman if Farwil falls to the forces of Oblivion will have him ask that you retrieve Farwil's signet ring. "All this, and now Farwil is dead. Oblivion is truly cursed. Make sure you take his signet ring to bring to the Count. He would want proof." Asking him about Farwil in this situation will have him tell you that you must inform the Count. "There isn't much more to say. He'll be missed. We'll have to inform the Count... if we get home." He will now occasionally comment on this tragedy as you travel through Oblivion; "What a horrible turn of events." 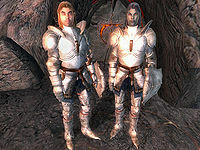 Ending a conversation with Bremman after Farwil has died at the hands of the Daedric Horde will have him claim that you should carry on through the gate despite this event; "We should continue for Farwil's sake." If you were the one to slay him he will be outraged at what you've done, "What's wrong with you? Farwil may have been a pain in the rear, but that was no reason to slay him!" besides this he will refuse to converse with you any further. If you escape Oblivion, Bremman will voice his joy over surviving that situation; "It's good to set my foot upon the soil of my home." Speaking to Bremman will have him express his joy of returning home alive; "Ah! Cheydinhal... it's good to see its walls again." Asking him about the Oblivion Gate will have him thank you for helping to protect his home and the Knights of the Thorn's reputation; "The gate has been closed. Finally, thanks to you, the Knights have a real victory on their hands." Asking him about Farwil if he survived will have him reply to your question by saying; "Perhaps in the future, Farwil will learn patience and careful planning before dragging us into a situation like that again." If Farwil perished in Oblivion, but not by your hand, he will reminisce on the memory of his old friend; "It's a shame Farwil is gone. Although he was boastful and aloof, at least he treated me as an equal. I shall miss him." Ending a conversation with Bremman at this time will have him say, "I never want to see one of those gates again." as a valediction. After you are debriefed by either Farwil or Amminus Gregori if Farwil died, Bremman Senyan will have a new salutation for when he sees you; "Thanks to you, Cheydinhal is safe." Ending a conversation with Bremman after being debriefed but before heading to Castle Cheydinhal to speak with Count Andel Indarys will have him remind you to travel there. "You should hasten to Castle Cheydinhal." 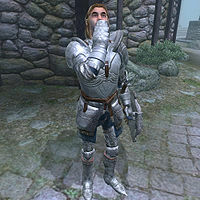 If you saved Farwil as well as Bremman from Oblivion, speaking to Bremman again after speaking with the Count to report the good news will have him identify you as a fellow Knight of the Thorn. "How good to see you again, fellow knight." If you complete Light the Dragonfires before saving Bremman from Oblivion he will greet you by saying; "How can I assist you today?" Asking him about Farwil will have him point you towards his usual hangouts; "He should be around somewhere. If he's not in the lodge, I'd try looking for him in Cheydinhal." Asking him about the Oblivion Gate will have him reveal his and Farwil's anti-climatic escape from Oblivion: "Strangest thing. One minute we're inside Oblivion, and the next thing I know we're back here and the gate falls apart. How odd."